Depending on which of the six quantities of the wind triangle are known and which are unknown, there are three principal types of problems to solve: ground vector, wind vector, and TH and GS. The following discussion gives the steps for the computer solution for each type. Work each sample problem and notice that the same wind triangle is shown on the computer that is shown on the chart, even though it is not completely drawn on the computer. This type of problem arises when TH and TAS are known by reading the flight instruments and when the WD and velocity are known from either the metro forecast or from calculations in flight. Study Figure 4-36 and determine what has happened. By flying a TH of 100° at a TAS of 210 knots in a wind of 020°/25 knots, the aircraft has actually moved over the ground along a track of 107° at a GS of 208 knots. Draw the wind vector from the grommet down the centerline, making its length (25 units) along the speed scale to conform with the windspeed (25 knots). 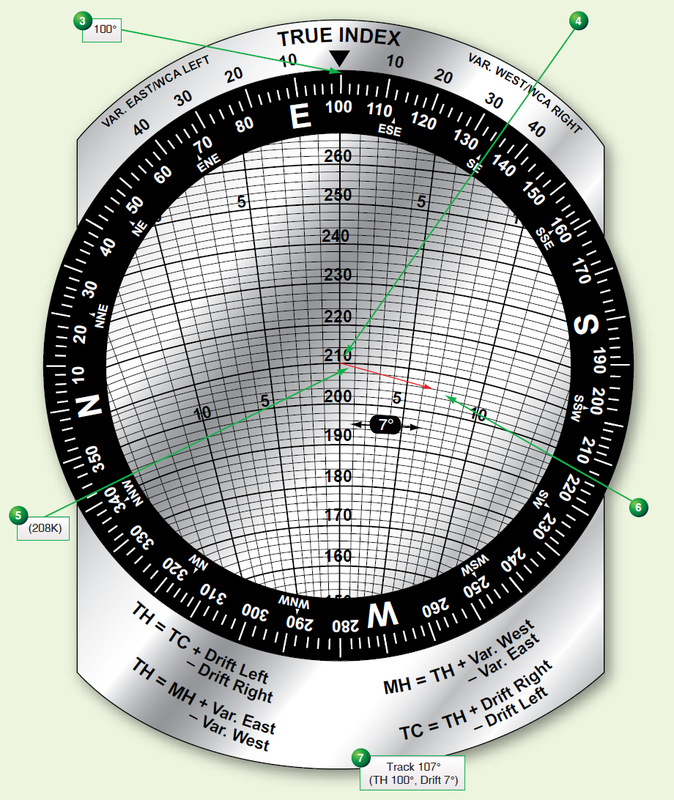 Set the TH (100°) under the true index by rotating the compass rose. Slide the card up or down until the TAS (2l0 knots) is under the grommet. The graphic solution is now displayed on the computer. [Figure 4-37] The ground vector lies along one of the radiating track lines with its head at the head of the wind vector. Read GS (208 knots) on the speed circle that passes through the head of the ground vector. Read the drift angle (7° right) by counting the number of degrees from the centerline to the ground vector; that is, to the head of the wind vector. Determine track (107°) by applying the drift angle to the TH. If the track is right of the center line, it is greater than the TH; so the drift angle must be added to the TH. An alternate method of determining track on the computer is to read the drift angle at the head of the ground vector, then transform this value to the drift scale on the same side of the true index and read the track on the compass rose of the circular disk. To find wind vector when air vector and ground vector are known. 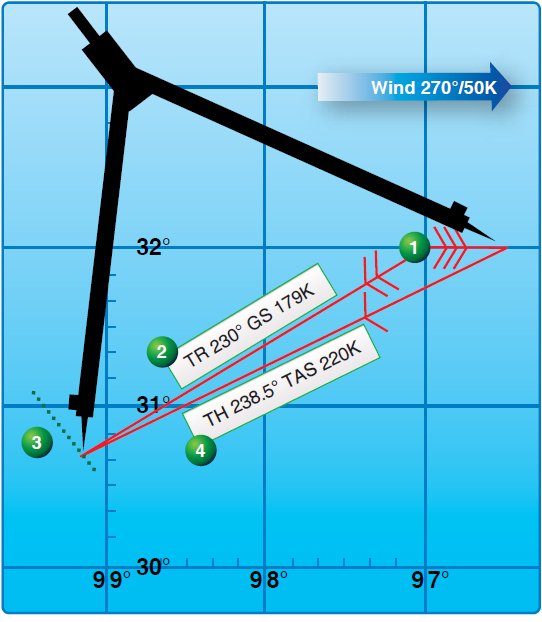 This type of problem arises when determination of TH and TAS can be done by reading the flight instruments and finding track and GS either by measuring the direction and distance between two established positions of the aircraft or by determining the drift angle and GS by reference to the ground. Refer to Figure 4-38 for a graphic solution. Set the TH (270°) under the true index. Set the TAS (230 knots) under the grommet. 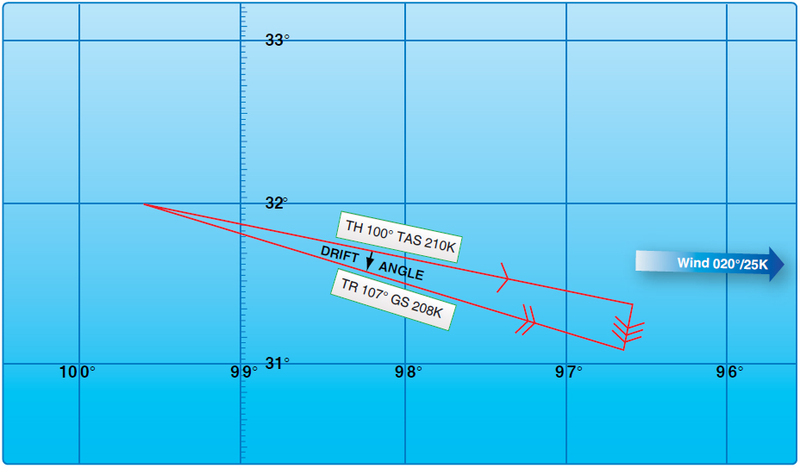 Find the drift angle (10° right) by comparing the TH (270°) with the track (280°). If the track is greater than the TH, drift is right; if it is less, drift is left. Find the appropriate track line on the computer (10° right of centerline). Find the speed circle (215 knots) corresponding to the GS circle. The wind triangle is now constructed. The mark made is the head of the wind vector and the head of the ground vector. 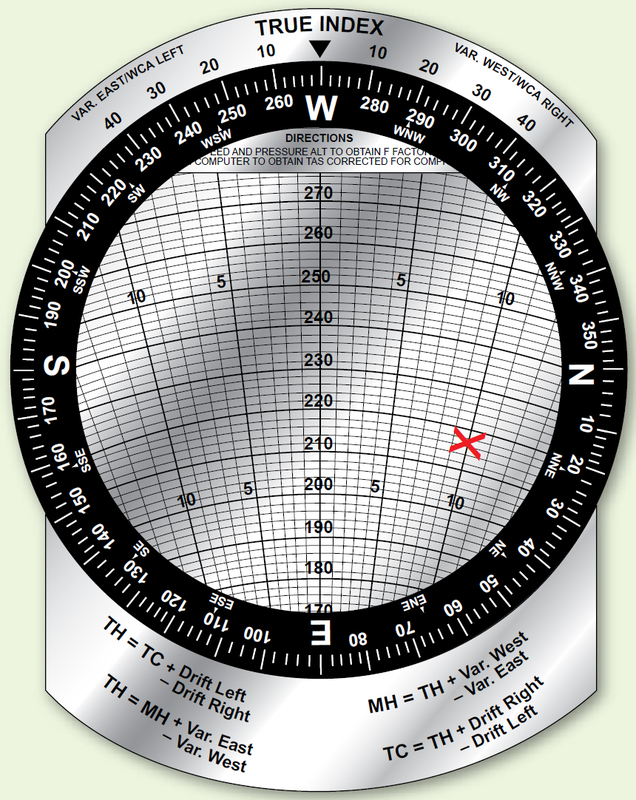 Rotate the compass rose until the head of the wind vector is on the centerline below the grommet. Read the WD (207°) under the true index. Read the windspeed (42 knots) on the speed scale between the grommet and the head of the wind vector. This type of problem arises before a flight or during a flight, when a TH is needed to be determined in order to fly and a GS with which to compute an estimated time of arrival (ETA). Figure 4-40. 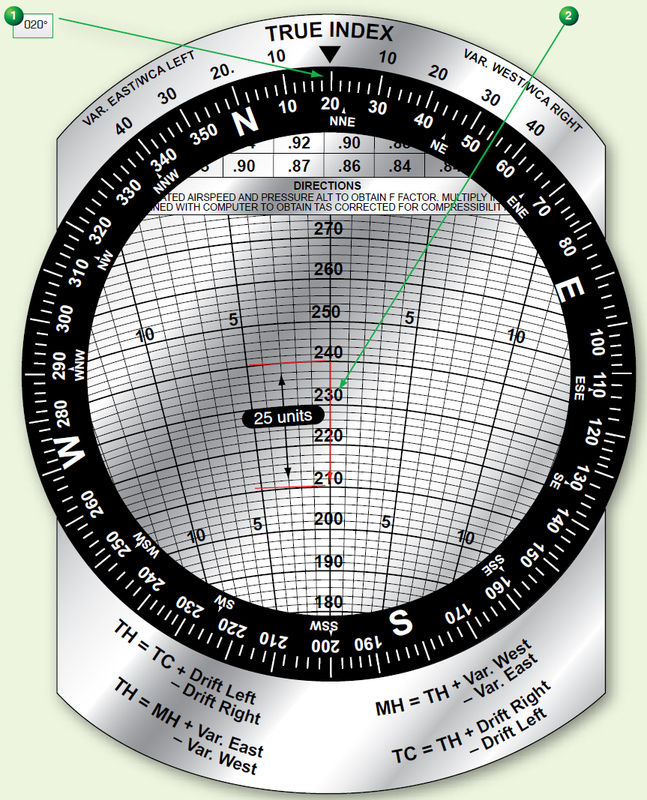 Solving for the true heading and groundspeed using chart. Draw the wind vector in any convenient scale in the direction toward which the wind is blowing (090°) and to the length representing the windspeed (50 knots) (from any origin). Draw a line in the direction of the TC (230°) and of indefinite length, since the GS is not known (from same origin). Open the dividers an amount equal to TAS (220 knots); then, from the head of the wind arrow, swing an arc with a radius of 220 NM to intersect the TC line (using the same scale as in step 1). Draw a line from the point of intersection of the arc and the TC line to the head of the wind arrow. To determine the TH (238°), measure the direction of the air vector. To determine the GS (179 knots), measure the length of the ground vector, using the same scale as before. There are two methods to solve for TH and GS: slip-and-slide method and the juggle method. Both are discussed; however, the slip-and-slide method is normally preferred. Set WD (270°) under the true index. Draw the wind vector down the center from the grommet, making its length along the speed scale correspond to the windspeed (50 knots). Set the TC (230°) under the true index. Set end of wind vector on the TAS (220 knots) by moving the slide. Read drift left or right (8° left). Apply drift correction mathematically to TC and set this computed TH under the true index (238°). Move the slide up until the grommet is on TAS (220 knots). The wind triangle is now set up correctly. Read GS at the end of the wind vector (l79 knots).